LEBANON, Ohio — Joseph's Legacy animal rescue in Ohio announced Monday it would end an animal-assisted inmate rehabilitation program at Warren Correctional Institution following the blunt force trauma death of a participating rescue dog. "Evie was an extremely sweet dog who had so much more life, happy moments and years ahead of her," the organization wrote on its Facebook page. "Our volunteers are hurting so deeply." According to Josephs Legacy, the year-old program involved partnering homeless dogs with "trusted inmates" to teach both basic skills for the future -- discipline for the animals and compassion for the inmates. Handlers at the prison said they found Evie, who was friendly and loving but needed practice following commands, "unresponsive" in a cell. Joseph's Legacy president Meg Melampy said a necropsy revealed on Sunday she had been beaten to death, the blows damaging her kidney and causing her liver to hemorrhage. "Nothing has ever happened like this," Melampy said. "We're all just distraught." She added she did not want to blame the prison staff, who were also "devastated" by the death, or cast aspersions on other programs that involve animal-assisted inmate rehabilitation, but the disturbing incident necessitated removing all of the participating dogs from the program immediately. "It's heartbreaking that this one or two individuals, whatever person or persons were involved, could ruin such a good thing for the dogs and the prison inmates as well," adoption coordinator Judy Reinhart said. The prison was investigating the incident, she and Melampy added. Evie, a fluffy mixed-breed with shepherd-like ears and a jutting underbite, was flea-infested, hobbled by a broken hip and nursing two puppies when rescuers found her, according to foster adoption coordinator Angel Ruby. She had been hit by a car after her previous owners abandoned her. When she reached Joseph's Legacy, recovered from her injuries and went home with foster owner Katherine Hartung, Evie's natural personality -- sweet, with a mischievous streak and a Houdini-like talent for escape -- emerged for the first time. She was adopted once but returned to the shelter "at no fault of her own," prompting Hartung to volunteer her for the prison program in hopes of learning skills that would help her land a forever home once and for all. "I can't imagine she's not here anymore," Hurting said. "To some folks, these dogs might not have much meaning. To a lot of folks, these are family members." The loss left Reinhart feeling as though she had somehow let Evie down. She and Melampy said they hoped the incident could become a learning experience for the prison as well as the rescue, helping close any loopholes that may have contributed to Evie being placed in the same space as violent inmates. 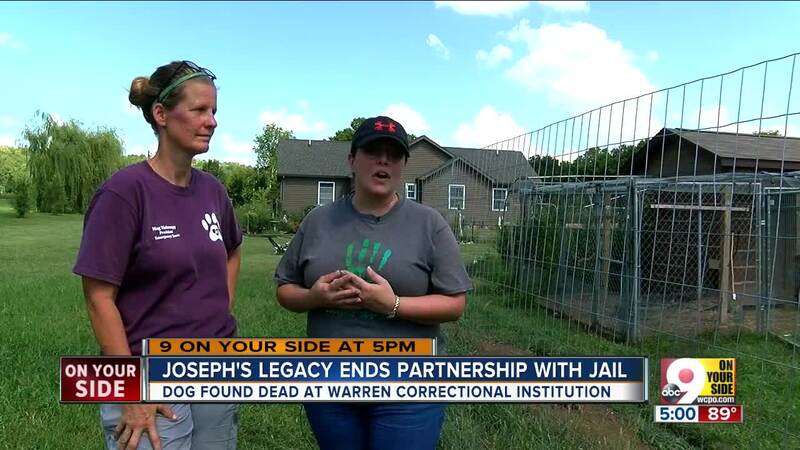 Will dogs from Joseph's Legacy ever go back to Warren Correctional? "Everyone is still too numb to consider," Reinhart said. "We're hurt. We have a long ways to amend to consider going back into another program." Joseph's Legacy wrote on Facebook that formal charges will be pressed but did not indicate whether a lawsuit had been filed. WCPO reached out to the Warren Correctional Institution and the Warren County Prosecutor's Office for comment.